Mish's Global Economic Trend Analysis: Now Presenting: Deflation! It's time to stop pretending. Deflation is here and it is now. Anyone who sees stagflation or inflation out of what's happening now missing the boat. Let's consider the evidence. Are short term interest rates at 1.16% and falling indicative of stagflation? Certainly not. Stagflation theories die on the vine with the above chart. It really is as simple as that. Interest rates are not supposed to fall in periods of stagflation.. However, short term rates at 1% or even .5% do not prove deflation either. Nonetheless exceedingly low interest rates are what one would expect in deflation. Japan's Zero Interest Rate Policy (ZIRP) is the model for what to expect. And if you are hiding out in treasury funds, expenses can take treasury yields negative. Please consider Negative Yields On Treasury Funds in the here and now. Pick your treasury fund carefully. Remember: Inflation is a net expansion of money and credit while deflation is a next contraction of money and credit. See Inflation: What the heck is it? if you need a refresher course. The above chart shows bank credit to be expanding at 10% annually. Certainly that is not deflation if the chart is accurate. But is the chart accurate? What if bank credit was marked to market? What would that look like? For that we turn to Bear Stearns (BSC). Bear Stearns went from $30 Friday and $130 in October to $3.17 at the open Monday March 17, 2008. For all practical purposes it went bankrupt overnight. Bear Stearns is not just some random company. Enron was a random company. Bear Stearns was a major US broker dealer with emphasis on was. In case you missed the story please consider PUT Buyers Celebrate Bear Stearns' Demise. Please consider the Wall Street Journal article Debt Reckoning: U.S. Receives a Margin Call. The U.S. is at the receiving end of a massive margin call: Across the economy, wary lenders are demanding that borrowers put up more collateral or sell assets to reduce debts. The unfolding financial crisis -- one that began with bad bets on securities backed by subprime mortgages, then sparked a tightening of credit between big banks -- appears to be broadening further. For years, the U.S. economy has been borrowing from cash-rich lenders from Asia to the Middle East. American firms and households have enjoyed readily available credit at easy terms, even for risky bets. No longer. Michael Nystrom's has an excellent post today called Welcome to the Future in which he discusses the debt margin call. Let's Take a look. Did you ever think news like that would ever make it off the internet and into the pages of the Wall Street Journal? Even I was beginning to have my doubts. But the news is seeping even further into the mainstream. This week's Time Magazine has an article titled "10 Ideas that are Changing the World." Idea #8 is "The New Austerity:"
Americans simply don't have enough money to pay back the mortgage and credit-card debt they've run up. That reality is forcing banks to retrench as loans gone bad shrink their capital bases and falling house prices shrink the collateral that homeowners can borrow against. And it will presumably force chastened consumers to change their ways as well. Here's something that Bernanke sure never thought could happen: "Americans simply don't have enough money". Furthermore there is little Bernanke can do about it. Bernanke claims to be a student of the great depression and the so called "lost decade" of deflation in Japan. However Japan did not have to face the overhang of massive consumer debt and global waged arbitrage that Bernanke has to face. Americans simply don't have enough money... What does it mean? It means defaults, economic loss and a spiral of fear and more loss. It means more Bear Stearns. Time's article quotes David Rosenberg, an economist at Merrill Lynch: "I'm not saying we're going back to our parents' level of frugality, but what we have witnessed in the past 20 to 30 years - and especially the parabolic credit growth of the last five years - is going to be bursting in the next decade." If not back to our parents' level of frugality, then what? To our grandparents' level? How can anything less be avoided, in an era when most people are already working full speed, maxed-out and yet still need credit to survive? And now they're cutting off the credit!? The result for households will be the same as for Bear - massive liquidation. And the Fed is in no position to do anything about it. The Fed is currently operating in triage mode - desperately trying to aid the banks and save the global financial system as we know it. But what ammunition does the Fed have to save the average American working stiff, who is up to his eyeballs in debt? Bernanke's prescription is the wrong medicine for the wrong time. Slashing interest rates to 1% or even 0% will only exacerbate the problem. All lower interest rates accomplish is a further weakening of the US dollar and higher import prices. The problem is consumers do not have enough money or high enough wages to support the consumption binge we have been on. Nor can consumers support their current debt loads. Higher gasoline prices caused by a weakening US dollar sure are not helping matters any. Nor will lower interest rates induce banks to lend when there is rampant overcapacity everywhere. Not every bank is capital impaired. Furthermore, many banks that are capital impaired are still lending anyway. That is the seen. The unseen is the massive destruction of the actual value of the debt that is on the books. It remains unseen because it is not marked to market. Bear Stearns falling to $2 shows just what marked to market means: one massive migraine headache. Reuters is reporting Dozens of U.S. banks will fail by 2010. Dozens of U.S. banks will fail in the next two years as losses from soured loans mount and regulators crack down on lenders that take too much risk, especially in real estate and construction, an analyst said. The surge would follow a placid 3-1/2 year period in which just four banks collapsed, all in the last year, RBC Capital Markets analyst Gerard Cassidy said in a Friday interview. Between 50 and 150 U.S. banks -- as many as one in 57 -- could fail by early 2010, mostly those with no more than a couple of billion dollars of assets, Cassidy said. That rate of failure would be the highest in at least 15 years, or since the winding down of the savings-and-loan debacle. Over a third of the nation’s community banks have commercial real estate concentrations exceeding 300 percent of their capital, and almost 30 percent have construction and development loans exceeding 100 percent of capital. Here in Florida, as in other states where housing is so important to local economic growth, the concentration levels are more pronounced. Over 60 percent of Florida banks have CRE loans exceeding 300 percent of capital, and more than half have C&D loans exceeding 100 percent of capital. It does not take a genius to figure out what is going to happen to that bank credit. It is going to plunge in value, just like the valuation of Bear Stearns' debt. From a practical standpoint bank credit is contracting already. Only the valuation remaining on the books is going up. "When you hold to maturity, you do not need to mark-to-market, and thus the loan will always be booked at face value." The above statement was made by a banker to Gary North last week. Gary just reported it so don't blame him. The statement is of course complete silliness. If interest rates are at 1% today and 10% a year from now on 30 year paper just how well capitalized would someone be holding a ton of 30 year paper? It's nonsense to pretend there is not a valuation change when interest rates changes. And in the case of MBS, some of that AAA paper is going to default. How much is debatable but there is no debate it will happen. And it is increasingly looking like there are going to be more defaults in AAA that anyone remotely thought. Not marking stuff to market is a moral hazard. It allows insolvent banks to keep making more and more loans until they blow up. Once again let's take a look at Evidence of "Walking Away" In WaMu Mortgage Pool. 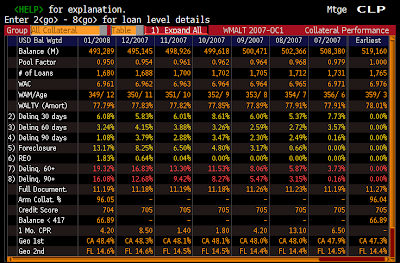 Following is a screen shot of a particular Washington Mutual (WM) Alt-A mortgage pool known as WMALT 2007-0C1. 92% of the pool is AAA rated pool. 15% of the whole pool is in foreclosure or REO after a mere 8 months. To say that you do not need to mark to market stuff held to maturity is nothing more than pretending. Banks need to be raising capital now instead of pretending that credit assets (mortgages, commercial real estate, HELOCs, Auto Loans, credit card debt etc.) are remotely worth full value. Bear Stearns shows exactly what happens when the market decides to force the issue. 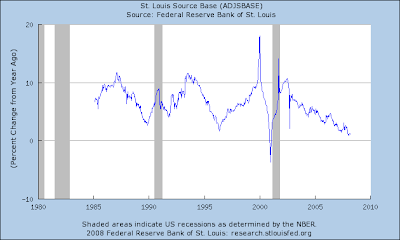 Chart courtesy of St Louis Fed. As you can see, base money is barely growing. 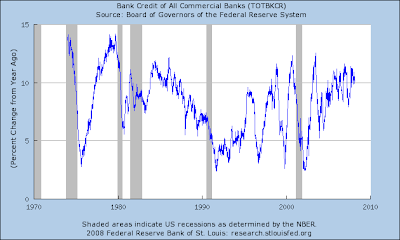 That chart disproves the idea the common manta "The Fed Is Printing". The Fed is categorically not printing. In addition, all these swaps from the TAF, TSLF, and PDCF are not printing either, not yet anyway. What there are is pretending. Current accounting rules allow banks to pretend. And certainly the Fed is going out of its way to bend the rules to allow new forms of pretending. Expect to see still more accounting rules that allow broker dealers to pretend. However, all the pretending and misdirection about the sinking dollar and the price of gold cannot stop the fact that deflation is about contraction of money supply and credit. The former is not growing and the value of the latter is collapsing no matter how many pretend otherwise. It's time to face the facts: Deflation is right here right now.